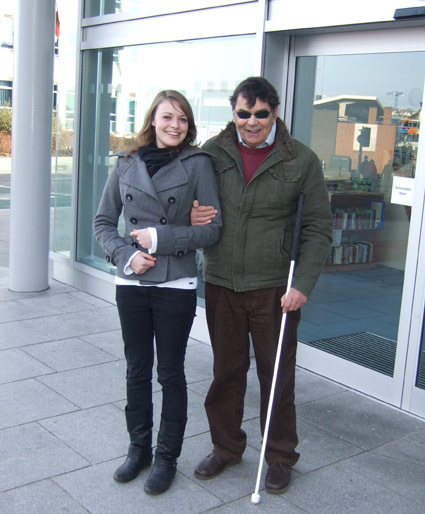 City Sights has been designed to provide a service to aid blind and sight impaired people access the city, with the help of a trained volunteer as their guide. The guide will be “matched” to the person if possible in terms of age and interests. The service can be used to assist with shopping, accessing entertainment facilities, going for coffee, visiting attractions and many other activities which require assistance to get there and get around. It is available to both visitors and residents of Exeter and to people of all ages, although anyone under the age of 16 will need a parent/guardian present. The City Sights service can be used in conjunction with the Ring and Ride service also offered by ECTA. This will enable people to be picked up from their home and taken into the city where they will be met by their City Sights guide and at the end of their trip returned home safely. The service operates Monday to Friday between 10am and 4pm and Saturdays 10:30am to 3:30pm. We can never guarentee the availability of a guide, but we will always do our very best to meet your needs. There is a small fee for the service of £2 per hour and advance booking is essential. Download our City Sights leaflet here.